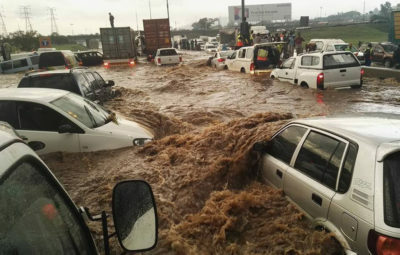 In December 2018 and early January 2019, Johannesburg was lucky enough to see a rather extreme downpour of rain. Considering the problems with droughts that the country has suffered over previous years, the wet weather came as a great relief to most of us. Unfortunately though, it resulted in it becoming clear quite quickly that our cities simply aren’t properly equipped to handle this amount of rain without consequence. Below, we take a look at various flood causes and what we can do to prevent them. The most obvious cause of floods is sudden, heavy rain – especially if the area’s infrastructure has not been properly designed for optimal run-off and drainage, or properly maintained. In South Africa, countless drainage systems are clogged with litter and debris. This is a problem that only the relevant municipalities can rectify, although it’s important for citizens to play their part by doing all that they can to minimise litter. Flooding can also be brought about as a result of overflowing rivers, broken dams and a lack of vegetation. When it comes to preventing floods, the focus needs to be on optimising town infrastructure. Careful town planning is a must. For starters, builders need to get permission from the relevant authorities before erecting any new structures which may affect stormwater management by blocking important waterways. The government also needs to strive to protect and cover drainage systems to prevent them from getting clogged and should ensure that they are properly cleaned out and maintained on a regular basis. As citizens, we can also make a difference by planting trees, shrubs and grass. This type of vegetation aids in protecting land from erosion that can be caused by rapidly moving water. Large amounts of vegetation are important specifically for people residing in low-lying areas who may be worse affected by the strength of travelling flood water. The vegetation will help to counteract its power by breaking it up, hopefully before it can cause substantial damage. It’s important that both the government and all South African citizens work together to help remedy the problems brought about by both droughts and flooding – and to do everything we possibly can to prevent these tragedies from occurring in the first place. For more information, contact Letsolo on 082 821 6621.